How Accurate Are Joe Lunardi’s Bracketology Predictions? ESPN analyst Joe Lunardi is known for two things: predicting the field for the NCAA Tournament and questionable hair that looks like it may have been stolen from an over-sized Lego figurine. Despite his obvious toupee and strange predilection for turtlenecks, Lunardi’s predictions have been exceptionally accurate over the years. Last season Lunardi correctly projected 66 of 68 schools with accurate predictions on the exact seed of 42 teams. You can view his most recent projections by checking out our March Madness bracket simulator. The table below displays how many teams were picked correctly, how many seeds were picked correctly and how many teams were within +/- one seed over the past decade. We should note that the field expanded from 64 teams to 65 teams in the 2001 NCAA Tournament. That number increased to 68 teams for the 2011 NCAA Tournament, with four play-in games accounting for the opening round — a decision that has perplexed college basketball fans for years. In the five years prior to the expanded opening round, Lunardi averaged 63.8 teams correctly predicted (98.15%) and 26.8 seeds correctly predicted. In the five years since the field expanded to 68 teams, Lunardi has averaged 66.6 teams correctly predicted (97.94%) and 36 seeds correctly predicted (52.94%). While Lunardi’s ability to accurately predict the field has continued uninterrupted, his ability to accurately project the exact seed has improved significantly. Although there are many March Madness prognosticators, Lunardi is unequivocally the most well-recognized. 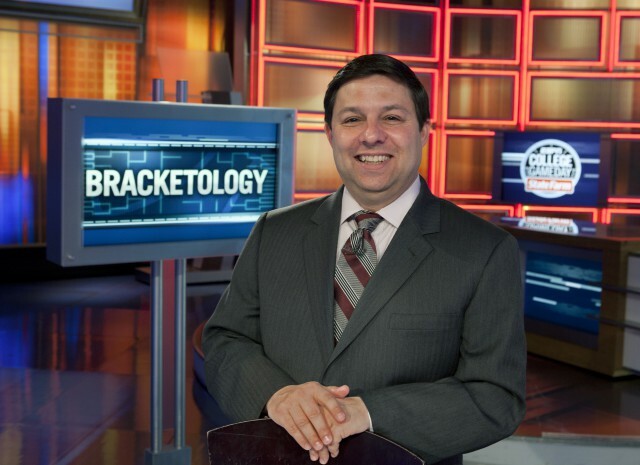 In fact, oddsmakers have taken note of Lunardi’s prowess and have posted several prop bets involving his final bracketology. Just over one month ago, 5Dimes posted seven different props regarding Lunardi’s predictions including an over/under on his correct predictions and odds for correctly predicting all 68 teams. These odds were dramatically different from the odds last year, where Lunardi was listed at -265 to accurately predict more than 66.5 schools and +300 to nail every single tournament team. In the most recent update, Lunardi’s odds of correctly predicting all 68 teams had dropped from +700 to +650 and the juice on under 66.5 teams dipped from -120 to -135. Given Lunardi’s track record we would lean towards taking the over, but even with reduced juice there’s very limited value. In another prop bet posted by 5Dimes, bettors can wager on the number of teams that Lunardi will accurately project from the “First Four” games played in Dayton, Ohio. Based on these odds, it’s more likely that Lunardi will miss all four (+700) than he will hit on all four (+1300). Bettors should also be sure to visit our free college basketball odds page for the latest lines, injuries, public betting trends and more. This season our NCAAB Best Bets have gone 157-129 with +15.4 units won. Get these winning picks plus live odds, bet signals, value meter, line watcher and more by signing up for a 4-day, $49 Pro trial. Schedule a demo with our customer service manager and we’ll tack on an additional four days for free!